Galaxy Note8, the latest flagship from Samsung, has won the ‘Gadget of the Year’ award at the inaugural India Mobile Congress (IMC), 2017. India Mobile Congress awards recognize innovations and initiatives that have helped transform the ICT ecosystem. Samsung, India’s biggest and most trusted smartphone brand, launched Galaxy Note8 in India on September 12, offering the next level Note for people who want to do bigger things. Galaxy Note8, Samsung’s most powerful smartphone, has received overwhelming response in India. “At Samsung, we believe in inspiring the world and bringing meaningful innovation to help make lives better. With the launch of Galaxy Note8, we have further strengthened our leadership in the premium smartphone segment in India and this prestigious award bears testimony to our efforts. 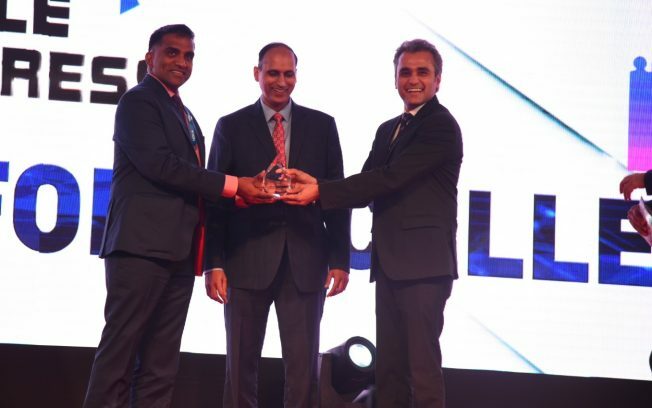 Our ear to ground approach led by innovative technologies across product and service categories have made Samsung a popular choice amongst consumers and it is a great honour to be bestowed upon with this recognition,” said Mr. Asim Warsi, Senior Vice President, Mobile Business, Samsung India. Galaxy Note8 is designed for the way consumers lead their lives and lean on technology today. The incredible Note series loved by millions of consumers in India also comes with the revolutionary mobile payment service, Samsung Pay, and Samsung’s defense-grade security platform Samsung Knox. Galaxy Note8 also comes equipped with Bixby’s voice capabilities, allowing consumers to experience a smarter way to interact with their smartphones. Staying true to Samsung’s legacy of ‘Make for India’, Bixby has been optimized to understand Indian accents.